With completion of the 4.5 MW Gold Tree Solar Farm, Cal Poly has created the single largest solar array in the CSU system. The single-axis tracking array will generate more than 11,000,000 kWh per year—25 percent of the university’s total electricity needs. 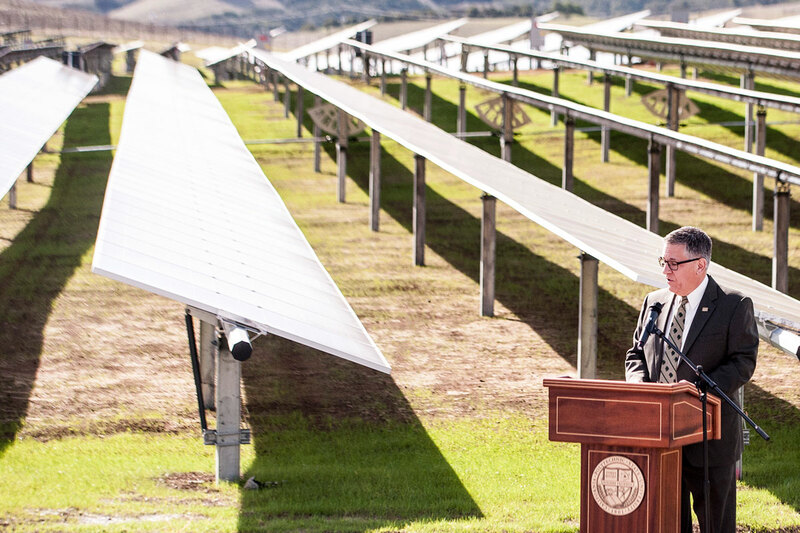 Funded by a power purchase agreement with REC Solar, a San Luis Obispo based company founded by Cal Poly graduates, the system will save the university some $17M over the next 20 years. To bring the solar farm into the classroom and laboratory, a comprehensive array of instrumentation and a web-based dashboard will make weather and performance data available for curriculum, applied research, and student projects. Constructed on 18.5 acres of Cal Poly sheep pasture, the site will continue to be grazed by the Animal Science department’s sheep herd to research vegetation management practices for utility scale solar farms. With a number of small solar arrays in the campus core, the project will also create a hands-on solar engineering and microgrid laboratory at the Electrical Engineering building. Using donated equipment, students in BRAE 470 - Solar PV System Engineering - designed and constructed a 5 kW solar array on the roof of the BioResource and Ag Engineering Building. Facilities took an active role in developing course curriculum and system design, and provided a mini-grant worth 5 years of the energy it will produce. 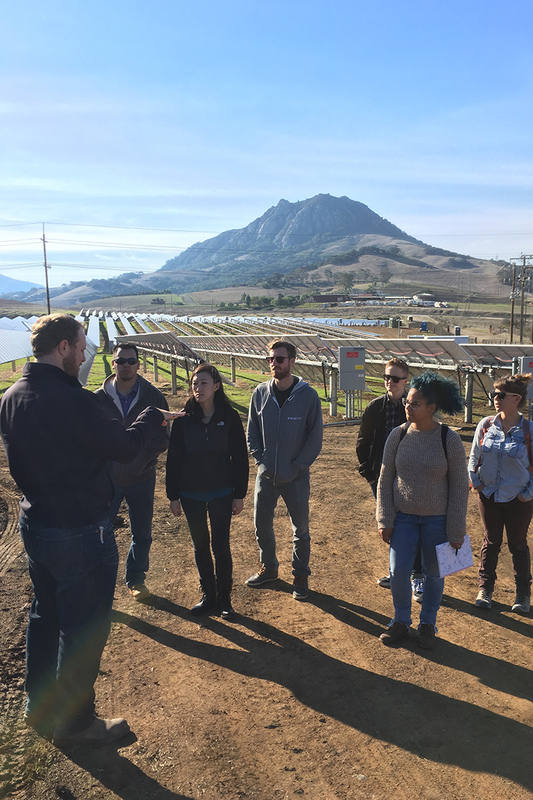 Students learned construction and safety fundamentals by participating in a Grid Alternatives installation in a disadvantaged community, then went on to create Cal Poly Project Solar, which received status and funding from Academic Affairs as an Instructionally Related Activity, with a goal to build more systems on campus. In October 2006, Cal Poly completed a 135 kW solar array on the roof of the Engineering West building – at the time, the largest solar system in San Luis Obispo County. The system generates approximately 290,000 kWh of electricity per year, enough to power about 26 homes. It also eliminates some 310,000 lbs of carbon dioxide emissions per year. The project was delivered as a third party power purchase, in which Cal Poly signed agreements allowing SunEdison to design, build, own and operate a solar system on campus property, while the University agrees to buy all the energy it generates at negotiated fixed rates for a 20 year term. Compared to power purchased from the grid, this will save Cal Poly approximately $100,000 over the life of the project, and provide a hedge against utility rate escalation. In December 2008, Cal Poly completed a 2.5 kW solar array on the roof of the Facilities Management and Development building. This project was funded by a grant from the San Luis Obispo County Air Pollution Control District, and was constructed by REC Solar. The system generates approximately 4,000 kWh of electricity per year, enough to fully supply six electric vehicles in the Facilities Management and Development fleet, making them completely carbon neutral. With over 6,000 acres of land near the campus core, diverse agricultural crops and livestock herds, a working dairy, and an active Bioresource and Agricultural Engineering program, Cal Poly has unique resources and opportunities to utilize biomass as an energy source. A 2008 feasibility study determined that campus livestock herds produce approximately 265,000 cubic feet of manure per year, currently managed by composting and spray field irrigation under Regional Water Quality Board permit. Campus also annually generates approximately 8,100 gallons of whey (a waste byproduct of the Dairy Products Technology Center), 300 tons of food waste from Campus Dining, and an unknown amount of greenwaste from the crops units and campus landscape operations. When these materials decompose by normal biological processes, they release methane to the atmosphere. Methane is a significant greenhouse gas, having 72 times the Global Warming Potential (GWP) of carbon dioxide during the first 20 years after being released to the atmosphere. Capturing methane from a digestion process to use as a fuel significantly reduces the greenhouse gas effects of the solid waste stream. 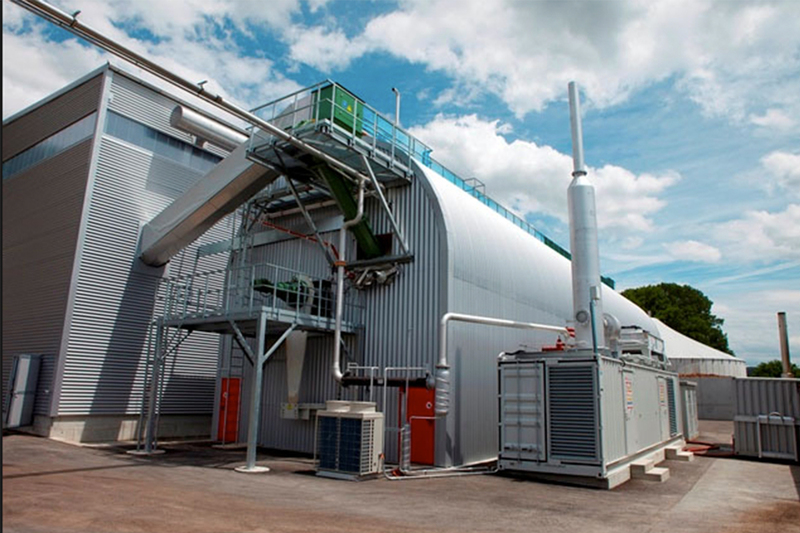 These waste streams could be used as feed stock for a combined heat and power system. Such a system would use anaerobic digestion or other technology to break down organic waste, producing methane to fuel a generator in the form of a reciprocating engine, fuel cell, or microturbine. Waste heat would be captured to provide space heating, domestic hot water, or hot water for process use. The digestion system would be constructed using above ground tanks, allowing the existing Dairy lagoons to be used for storm water control rather than continuous storage, improving Cal Poly's compliance with State waste water and storm water regulations. Alternately, a digestion process could be used to generate methane that would be injected as pipeline gas into the campus' natural gas distribution system, for consumption at other campus facilities. Cal Poly’s approach to collaborative public-private partnerships that integrates academics into infrastructure will be a model for the future, and is a fundamental part of the next round of energy generation projects being developed. Feasibility studies are under way to assess the opportunity to develop wind generation on campus. Using historical wind speed data from the Cal Poly Wind Research Center on Escuela Ranch, 3D computer modeling was used to assess wind resources across 6,000 acres of campus land. Four potential locations with the best wind speeds are being evaluated for more detailed study.